we encourage **NEW supply donations from the public as well. 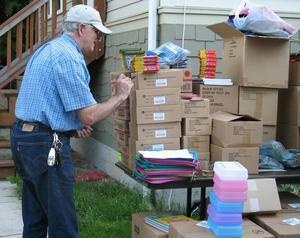 "Rotary Club of West Seattle"- a 501C non-profit organization. Write “Pencil me in for kids” on the memo line of checks. If you would like a receipt for your tax records, please be sure to include a valid return address with your cash/check donation. **For health/safety reasons, we are only able to accept NEW supply donations. ONLY the following supplies are donated. THEY are the MOST requested items from ALL schools. Supplies that are in the highest demand are listed in RED. ...Is not a national program. 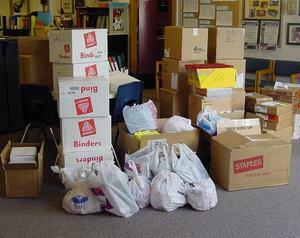 It is a single organization that helps out elementary schools in West Seattle/South Park. If you would like to receive information on how you too could start a program such as "PMIFK" in your area, please contact us at pencilmeinforkids@gmail.com . We know the need is out there, we just need people like you to reach out and provide it for the kids in your area. Over the past years, we have provided not only the opportunity for kids to go to school with the much needed supplies, but have also reinforced the need to volunteer in a community. As an ALL VOLUNTEER organization, we have been able to provide volunteer hours (required) for local high school kids, as well as fulfill job requirements for advancement of employees at local businesses, who encourage community service as part of their job descriptions.